How to whiten sensitive teeth! Happy Friday Sugar Fix Fans! Many of our patients want to know how to whiten sensitive teeth, this week, we have a great tip for you! Dr.Dr. Emery always recommends that our patients use Flouridex, it is a fluoride toothpaste with sensitivity relief. You would use this 2x a day in place of your regular toothpaste before doing your in-office Zoom whitening. We just had a patient in yesterday with no sensitivity at all during her procedure and she used the toothpaste for two weeks. It works great! Check out her amazing results below! Besides just for sensitivity, Dr. Emery recommends Flouridex to many of our patients that are prone to decay or “soft” teeth. It really is a great product to use overall and to whiten sensitive teeth! We had a great case this week at Sugar Fix that we are so excited to share! 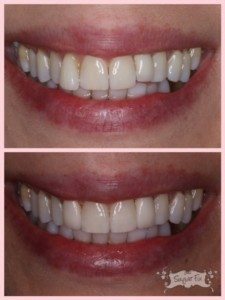 Below is a patient that came in for a consultation to fix her lateral teeth. The one was very long and the other side was too short creating a slanted smile line. 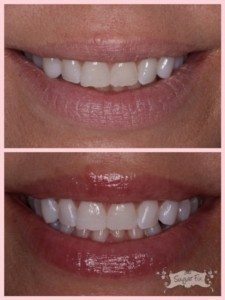 Afterwards, we were able to create an even and beautiful smile that blends flawlessly with her natural teeth. We are so happy for our patient’s new found confidence and radiant smile! This week we had an office celebration at STK restaurant downtown celebrating Dr. Emery and her 10 year Anniversary at Sugar Fix Dental Loft! 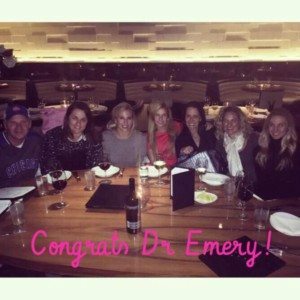 Dr. Emery really has created such a beautiful transformation with Sugar Fix. From being an old record store to a glamorous yet comfortable boutique office- you can see all the hard work she has done to make it all happen! We are all so very proud of her and glad to call Sugar Fix our second home. That is all for this week, stay tuned!